Besides the faith one places on the scriptures which provides the fulfillment of prophecy and archaeological evidence, we have scientific evidence that serves Testimony to the glorious and powerful events of the Father in the Old Testament and the miracle of the birth, death and resurrection of the Messiah which serve as undeniable proof He is the Son of the Living God - one of the two elements that constitute The Nazarene Code. Look at the videos located in the bottom section as well - they conclusively prove the earth is flat and stationary as scripture claims and how the moon and mars missions have been completely faked - incapable of getting thru the Van Allen Belts and Thermosphere. This page was added for the atheists, agnostics, weak of faith and for those whose religions do not believe in the divinity of the Messiah. We have in fact forensic scientific evidence not only from His astronomically significant birth but His geologically significant death and scientifically inexplicable resurrection as well. This forensic evidence is unlike any found anywhere or at any time in the history of mankind. So unique are the properties of this evidence that they defy explanation and are in fact, supernatural in nature. Furthermore, science is supporting the Word of God and disproving academic theories being taught from elementary schools to universities worldwide. Take a moment then to view the videos below and once you weigh the facts you will understand why the Nazarene fulfills prophecy and why His followers would give their lives to testify that He was and could only be the Son of God the Father and Creator of the Universe. 4. The Shroud of Turin Proves He Is "The Nazarene"
The "Blood Moon" lunar eclipse of 3 April 33 AD, 3 hours after Jesus died on the cross that lasted 333 minutes and 66 degrees on the horizon, fulfilling Joel 2:31/Acts 2:20. Catalogue of historic lunar eclipses that witnesses described as "Blood Moons". The Science behind Lunar eclipses. The Science behind a "Blood Moon". When did Herod the Great die? The "Blood Moon" lunar eclipse of 1 BC that happened just before the birth of Christ and marks Herod's slaughter of the children. 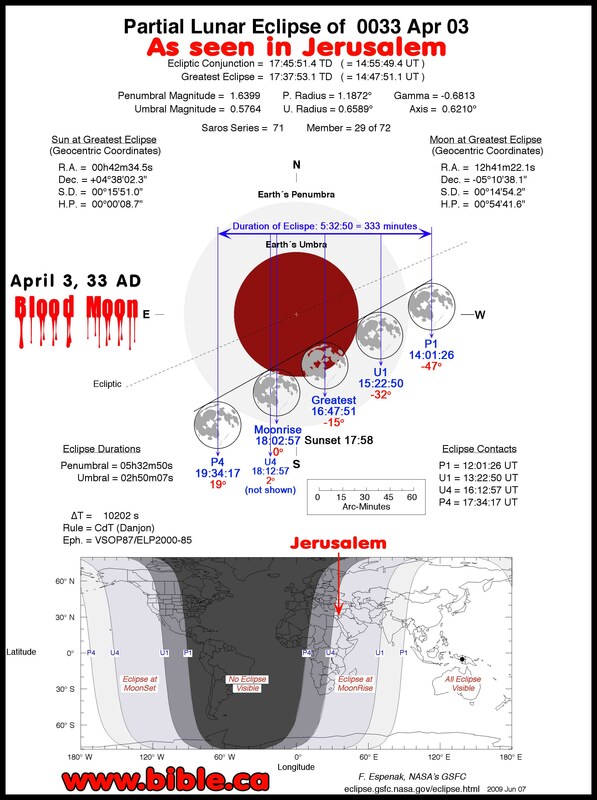 Refutation of John Hagee's FOUR BLOOD MOONS in 2014/15. 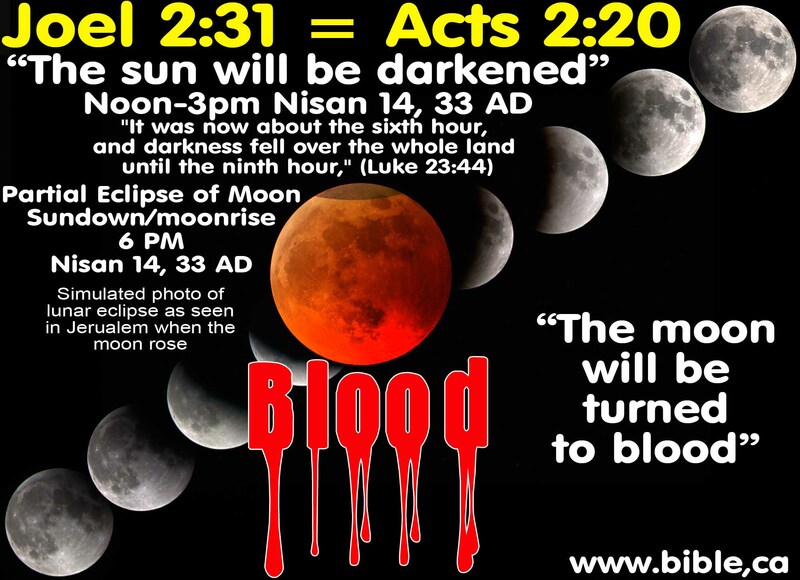 Mark Biltz and John Hagee's are both predicting huge world changing events on or before 23 September 2015 (Yom Kippur). Birth of Christ: Spring 1 BC: 10 January 1 BC: Eclipse of moon spoken of by Josephus (Antiquities 17.167) marking the birth of Christ, Herod's Slaughter of the children, the death of Herod the Great. Total and Partial Eclipses appear blood red in colour when viewed at sunrise or sunset as our photographs show. Bradley E. Schaefer is wrong when he says the eclipse on 3 April 33 AD would not be noticed by those living in Jerusalem. We do not question Schaefer's science, only his interpretation of the numbers, which we have proven in error by actual photographs and eyewitness accounts of blood red Penumbral Eclipses. Perhaps now we know why Schaefer has never supplied any photographic evidence to support his false conclusions! As a young earth creationist, Danny Faulkner of AIG should know better than to make the cardinal mistake of accepting both the science of Bradley E. Schaefer (which is valid) and Schaefer's interpretation of the science (which is invalid). Perhaps Faulkner should memorize the slogan: "Its not science vs. the Bible but the theoretic conclusions of scientists vs truth. 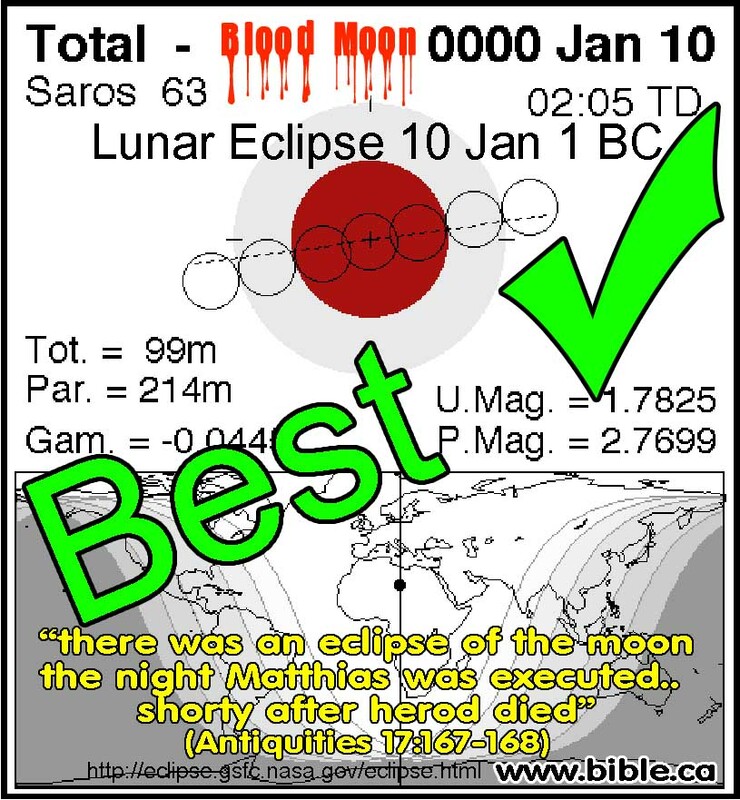 The total Lunar Eclipse spoken of by Josephus is 10 January 1 BC. Jesus was already en route to Egypt and the Magi who were attracted by "His Star" would notice the eclipse as they were en route back to Babylon. Josephus tells us that this total lunar eclipse marks night that Herod executed Matthias of the high priestly house. Since Josephus is totally silent on Herod's slaughter of the children 2 and younger, this eclipse likely marked this event too. January 1 BC harmonizes well with Andy E. Steinmann, who is the most trusted chronology today on this subject. the duration of the Umbral part of the eclipse would be visible for 12:30m. As the moon rises the first portion will be almost entirely in the umbral shadow and the rest of the moon with direct sunlight will be hidden below the horizon! This will give the moon the deepest possible blood red colour and it surely would have been noticed by millions in the ancient world! The moment the sun sets in the west the eclipsed umbral moon rises in the east in a very noticeable deep blood red colour. When viewing the light of an eclipsed moon at sunset and moonrise, the light is refracted not once but three times causing a double reddening effect of the light hitting the moon and a third reddening effect as the reflected red light of the moon is refracted back into the atmosphere where it enters our eyes. Each sequential refraction transmits a deeper, redder hue. When viewing the light of an eclipsed moon at sunset and moonrise there is a triple atmospheric absorption/scattering of blue light creating a much deeper red than a normal moonrise. The umbral eclipsed part of the moon rises first followed by the darkest penumbral edge of the eclipse while the portion of the moon that is in direct contact with the sun is HIDDEN far below the horizon. The actual length of time the Umbral eclipse would be visible AFTER moonrise due to atmospheric refraction which adds no less than 150 seconds to the viewing time below the horizon and a larger percentage of the umbra visible in blood red. Full moon shift, due to magnification, refraction and parallax averages 225 seconds. This means that you would see a larger portion of the umbral eclipse for a total time of 825 seconds (13.75m) after apparent moonrise until the umbra disappeared. Below are videos that clearly demonstrate the significance of this incredible world we live in - it is NOT what we've been "educated" and lied to believe. We do, in fact, live in the most unique place in the heavens and each of us have a significant part to do with its existence for the simple reason we inhabit it - and we inhabit it for a very special purpose by The Creator. Job 26:10: "He has encompassed a circle on the surface of the waters At the boundary of light and darkness." that stretcheth out the heavens as a curtain, and spreadeth them out as a tent to dwell in."